Strike! Barbara Ehrenreich Calls on TSA Workers to Walk Off Job in Protest of Government Shutdown | Democracy Now! "It's Time for T.S.A. Workers to Strike"
AMY GOODMAN: The longest government shutdown in U.S. history is now on Day 27. As 800,000 federal workers continue to go without pay, federal employees around the country are rising up to demand an end to the shutdown, which has run public institutions ragged and left hundreds of thousands financially strapped. On Capitol Hill, federal contractors held a protest outside the office of Senate Majority Leader Mitch McConnell and other Republicans, saying the shutdown threatens to deprive some 4 million contract workers of hundreds of millions of dollars in expected payments. There are reports of skyrocketing absences among federal workers forced to work without pay. This is Congressmember Alexandria Ocasio-Cortez delivering her first speech on the floor of the House. REP. ALEXANDRIA OCASIO-CORTEZ: The truth of this shutdown is that it’s actually not about a wall, it is not about the border, and it is certainly not about the well-being of everyday Americans. The truth is, this shutdown is about the erosion of American democracy and the subversion of our most basic governmental norms. It is not normal to hold 800,000 workers’ paychecks hostage. It is not normal to shut down the government when we don’t get what we want. It is not normal for public servants to run away and hide from the public that they serve. And it is certainly not normal to starve the people we serve for a proposal that is wildly unpopular among the American people. AMY GOODMAN: That was New York Congressmember Alexandria Ocasio-Cortez. House Speaker Nancy Pelosi called Wednesday for President Trump to cancel his State of the Union address later this month, arguing the government shutdown has left the Secret Service and Department of Homeland Security starved for funds and unprepared to simultaneously protect all three branches of government. Meanwhile, the Transportation Security Administration has become a flashpoint for growing outrage over the mistreatment of federal workers due to the shutdown. In Florida, the Tampa airport has set up a food bank for unpaid TSA workers. In Phoenix, Arizona, a food bank served nearly 300 TSA employees from a mobile pantry. TSA workers rallied in airports in Sacramento, California, and Baltimore, Maryland, Wednesday, warning that the shutdown is threatening aviation security. Hundreds more around the country have been calling in sick, with the agency reporting more than 6 percent unscheduled absences in what some are calling a “blue flu” protest. On Wednesday, TSA employees protested outside Dallas/Fort Worth International Airport and the Los Angeles International Airport. This is TSA union leader Bobby Orozco speaking in Los Angeles, where TSA agents signed up for food cards after rallying. BOBBY OROZCO: So, as you see behind me, a lot of the folks are getting food, you know, trying to get whatever they can get in order to survive. I mean, right now it’s just high anxiety. Not only did we not get our last paycheck, but it seems very likely that we may not get our next paycheck. AMY GOODMAN: As TSA workers continue to go without pay, airports are experiencing staggeringly long security lines and a host of other problems. The TSA recently acknowledged a man with a loaded pistol passed through airport security at Atlanta International Airport. Barbara Ehrenreich, welcome to Democracy Now! Talk about the shutdown, its effect on workers, and what your demand is. BARBARA EHRENREICH: Well, I should say that my co-author on this piece is a longtime union organizer, who was, in fact, at one point, the director of organizing for the Teamsters, also worked for government workers’ unions, so there’s a lot of experience that goes into this little op-ed we did for The New York Times. And our point is, don’t just take this lying down. Yes, there’s a “blue flu,” and there’s, you know, people looking for other jobs and everything, but look at the way airport workers and federal employees, in general, are being treated. They’re being treated in a mean and humiliating fashion. When Trump said this week, essentially, “You can come back to work, but, you know, you’ll get paid at some point, we can’t tell you exactly when, when the shutdown is over,” that’s not how you respectfully treat American workers. The idea is you work for money; otherwise, it’s in violation of the 13th Amendment, which bans involuntary servitude and slavery. AMY GOODMAN: Is there a ban on federal workers striking? BARBARA EHRENREICH: Yeah. Yeah, there are plenty of bans. 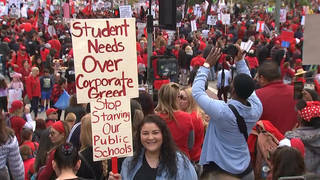 There were—last year, 2018, when there were teachers’ strikes all over the country, five different states, those were illegal strikes, you know, technically speaking. I mean, especially in the public sector, the right to strike has been so limited. So, you have to go ahead anyway. In the ’60s and in the ’70s, there was a tremendous amount of public sector worker organizing. All illegal. I mean, striking, as well as organizing. So, yeah. AMY GOODMAN: I want to turn to Lamar Cobb, lead TSA officer at Baltimore/Washington International Airport. LAMAR COBB: I have a little 10-year-old daughter that is my pride and joy. She’s my heart. I actually had to take her out of cheerleading, because I didn’t have the money to pay for her to continue it. It’s hard. It is, as a man, personally, and my daughter being my pride and joy. And me—like, we don’t make a lot, like everybody thinks, like, “Oh, you know, you’re supposed to have three to six months’ savings.” But that’s hard when you’re not making that much to have three to six months’ savings, and you have bills, and you’ve got to figure out if you’re going to pay your car payment or if you’re going to pay your rent or your life insurance. You have to basically pick options. It’s been very hard, actually, especially when you do it on your own, you know? AMY GOODMAN: So, that’s Lamar Cobb, lead TSA officer at Baltimore/Washington International Airport. What’s astounding about all of this, Barbara, is that President Trump says he’s doing this for national security, yet among those who are hardest hit are those who enforce national security—the TSA workers, the border guards. The Coast Guard, for the first time, is not being paid. BARBARA EHRENREICH: Well, yes. But please don’t ask me to explain anything Trump does. You know, another element in all this—and I’m not being conspiratorial here, but one of the goals of the far right in this country for a long time has been to shrink government, or at least shrink the parts of government that they don’t like, the parts like “welfare,” as they call it, or Social Security, etc. And that’s what—that may be part of the motivation, and certainly part of the outcome of the shutdown. AMY GOODMAN: You know, it’s interesting you should raise this, Barbara. I wanted to turn now to Fox News, which—well, how they’re covering the shutdown. In this clip you’ll hear Steve Doocy of Fox & Friends, but first Fox contributor Charlie Hurt. CHARLES HURT: You could shut down half of the government agencies, and literally it would be years—if it were not for the media, it would be years before the regular person, the normal, average working American, would even know that the department had been shut down, in terms of, you know, how much it affects their lives. STEVE DOOCY: A lot of people across the country don’t even notice that part of the federal government is shut down. AMY GOODMAN: Barbara Ehrenreich, your response? BARBARA EHRENREICH: Well, I think a lot of people are noticing it. I mean, think of all the groups affected—the contractors, who, as you mentioned, Amy, actually had a sort of demonstration, the federal government contractors, and all of their employees, which amounted to what? They estimated 4 million around the country? AMY GOODMAN: I mean, this is very significant—you’re talking about outside Mitch McConnell’s office—because these millions of people—of course, there was a much smaller group in front of McConnell’s office—but they will never be paid. These are not workers that are paid directly by the government. BARBARA EHRENREICH: Mm-hmm. No, the reverberations of this are very easy to see, certainly here in the Washington, D.C., area, which has so many government workers, federal workers. But there are things like food stamps that depend on being processed by federal agencies. So many things. Income tax collection—well, they’ve straightened that out a little bit, because they need the money. But there—yeah, there’s a huge impact. And if enough airport workers were to either walk away from the job or go on strike, that would shut down the airports. And that would be—that would just shut down the economy. They couldn’t—we wouldn’t—I think even Trump wouldn’t let that last for more than a few hours. So, that’s one possibility. AMY GOODMAN: Bob Hennelly, the veteran labor reporter, wrote at Salon, saying, why not a general strike in support of the 800,000 federal workers currently not receiving a paycheck? BARBARA EHRENREICH: That’s fine. You know, I just—that’s an awfully big undertaking. I think the iron is hot right now around these federal agencies. I don’t know how—you know, anybody want to call a general strike, I’ll get behind it. But it’s just a very hard kind of thing to do. AMY GOODMAN: I wanted to go to one of the agencies that has been shut down, talking about the various places in the country. I wanted to go to the Coast Guard. These are—you know, it’s very unusual. One branch of the military that will be impacted by the government shutdown is the Coast Guard. Its 42,000 active-duty members will miss a paycheck for the first time in history. The Coast Guard Support Program published a five-page tip sheet titled “Managing your finances during a furlough,” which was obtained by The Washington Post. The tip sheet suggests Coast Guard members stay financially afloat during the shutdown by holding a garage sale, babysitting and dog walking. Barbara Ehrenreich? AMY GOODMAN: They’re also, of course, setting up food banks throughout the country. BARBARA EHRENREICH: Well, that—actually, the Coast Guard had to take that down off its website, because they had so much mockery at the suggestion that workers could support themselves by dog walking and garage sales. No, this is laughable, insulting responses. I think we—you know, and one reason a strike might be a good thing is it would help to reignite the old, you know, fighting spirit of American labor. I come from a tradition of union people who did not take certain kinds of crap. They just said, “That’s it.” You know, at a certain point, you go on strike and assert your dignity and make your demands and your problems known to the general public in every way you can. So, I think this would be the moment. AMY GOODMAN: So, as you go back in time, Barbara, I wanted to go to 1981, to PATCO, the Professional Air Traffic Controllers Organization, when it went on strike to protest wages and working conditions, this famous moment when President Ronald Reagan responded by firing the 11,000 highly skilled workers, replacing them with military personnel. This is Reagan speaking August 3rd, 1981. PRESIDENT RONALD REAGAN: I must tell those who fail to report for duty this morning, they are in violation of the law, and if they do not report for work within 48 hours, they have forfeited their jobs and will be terminated. AMY GOODMAN: That’s President Reagan in 1981, breaking PATCO. Describe what happened next. My biggest response to that is to go from 20—I mean, excuse me, from 1981 to 2018, when we saw a wave of strikes around the country, teachers’ strikes. And as I mentioned, those were, in most cases, illegal strikes. And people did it anyway. And that inspired, or helped inspire, other forms of labor militancy. You know, when people see that someone stands up to gross injustice and insulting behavior, then that person is empowered to stand up, too. AMY GOODMAN: So, at the very top of your New York Times op-ed, you write, “Last week, in a meeting with Democratic leaders, President Trump called the government shutdown a 'strike. '” He called the government shutdown the strike. Can you explain this? BARBARA EHRENREICH: Oh, God, no, I can’t explain that. But, you know, it was like some desperate effort to shift the blame. You know, he’s always blaming the Democrats for the shutdown, and here he made a stupid bid to blame the workers themselves for the shutdown. So, you know, I’m saying: Why not just call it a strike? You’re not being paid anyway. And maybe you will come out of this with greater power over the conditions of your work. AMY GOODMAN: I wanted to turn to the Dallas airport, to the federal workers protesting outside Dallas/Fort Worth International Airport. This is Sarah Fry speaking to CBS. SARAH FRY: That it’s your neighbors. Your neighbors are the ones having this anxiety, having this stress. … We just bought a new house in June, and I’ve been aggressively paying down my student loans. And I expected to have a paycheck. I planned on working all through the holidays. And it’s really tough, and it’s really stressful. AMY GOODMAN: And you have a State Department employee who told The Washington Post the government shutdown is putting a strain on his colleagues and him. TONY MAZZOCCOLI: It honestly makes me really sad thinking about people worried, right now, sitting at home, eating dinners with their families, and not knowing whether or not the next paycheck is coming in. Nobody should ever be in that position. And I don’t think that those of us who signed up for the government ever—we never wanted to see anything like that happen. I’ve been through furloughs before, back in the ’90s. And quite frankly, it was frightening back then. OK? And I think that civil servants, in particular—and I will say this also on behalf of my Foreign Service colleagues, my military colleagues—all of us deserve a little bit more respect. AMY GOODMAN: So, we’re talking about millions of people affected. Finally, Barbara Ehrenreich, let’s go back to the beginning and the headline of your op-ed. Why do you think, in particular, if TSA workers struck, if the airports were closed, it would end the government shutdown immediately? BARBARA EHRENREICH: Because business would be so directly impacted. You know, who’s in the airports on a normal weekday? It’s businesspeople traveling from one meeting in one city to another. If they couldn’t do that, well, maybe they’d learn to Skype, which would be a good thing, but, you know, there would be—the impact would be immediate and very serious. And affecting business, that would mean phone calls would be made to Washington, and things would get straightened out pretty fast. AMY GOODMAN: And finally, Nancy Pelosi’s response to President Trump, because she has to invite him into the House for the State of the Union, a great theatrical affair, saying, go back to what they did for years—the presidents—you can just write down your State of the Union address, your report about the country, or wait 'til the government shutdown is over, but you're not welcome here now. Too dangerous, she said. BARBARA EHRENREICH: Right, that she feels that they don’t have the security forces. But it’s great. It’s so wonderful to see Nancy Pelosi develop this strong spine recently and stand up to Trump and, in the process, infuriate him. This is Democracy Now! When we come back, how is this affecting Native America, Indian country? Stay with us. AMY GOODMAN: “Only the Guilty Cry” by Clydie King and The Sweet Things. Clydie King died January 7th at the age of 75. She was a legendary backing vocalist who worked with some of the biggest names in music, including The Rolling Stones, Linda Ronstadt and Bob Dylan.